Canada Red Chokecherry can be grown as a single or multi-stemmed small tree or large shrub. 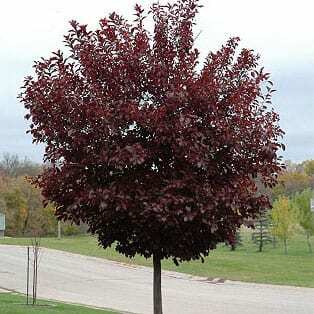 The distinguishing feature of Canada Red Chokecherry is its purple foliage color. New leaves emerge green and turn purple as they mature. Small white flowers in hanging clusters 3-5″ long are produced in May. The edible fruits are small, reddish-purple, and relished by birds. Tree form is upright oval. Plants naturally form many root suckers. Thus the plants develop into thickets if new suckers are not removed.